Address: Varies, check their web site! Update: Like any food truck, Chi-Lantro is both mobile, and has seen enough success to go brick-and-mortar, with (as of 2015) two restaurant locations. Check out their web site for details. My visit to Chi-Lantro was part of the Central TX BBQ Run. After finishing up at the Eastside Drive-In food carts, a few of us headed downtown to check out Austin’s Sixth Street nightlife, grab a few drinks, and check out a few more food carts. 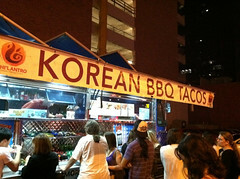 One of the places I had actually gotten several recommendations for was only a brief detour off of our Sixth St forays: Chi-Lantro Korean Taco BBQ Truck was set up for the night at 5th and Colorado. A note of warning: Unlike many of the food carts I’ve discussed here that are semi-permanently moored in various courts and alleys, Chi-Lantro is definitely mobile and has a semi-regular circuit. While I came across them at 5th and Colorado downtown, if you are wanting to check them out, I highly recommend checking out their twitter feed. I don’t know exactly when they became common (I’ve been hearing about Kogi in LA for several years now, for example), but the Korean Taco truck has started to become a serious mainstay of the street food scene. And while ethnographically odd, it’s actually a combination that makes a fair bit of sense, with the nice spicy and savory, but not always conveniently packaged for street dining Korean food meets up with the handy tortilla to make something that’s just about perfect for street dining. However, while the many tacos being served out of Chi-Lantro were definitely looking delicious, I was seeking out Chi-Lantro for another reason altogether: Kimchi fries. Anyone that knows me knows that I love Kimchi, and am known for downing copious amounts of it with every trip to our local Korean joint. And I love french fries as well. Well, Chi-Lantro combines these into a masterful dish: nicely cooked French fries, topped with your choice of bulgogi (I opted for pork, but beef and tofu were available as well), kimchi, cheddar sauce, some weird “magic orange sauce” of their own make, sriracha, sesame seeds, and a healthy handful of cilantro. It’s quite a mess to behold, but it’s quite the flavor and texture explosion. Everything works with this combinations. The flavors are bold, but combine well. 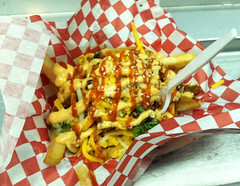 The fries have the perfect texture to serve as a substrate, and the sauces give it some good body and moisture. The kimchi and bulgogi give it a good spicy and savory note, and the cilantro gives it just a bit of green and some crunch. While probably impossibly unhealthy, this was a seriously good street food late-night snack. They even have a second truck right off 6th st…on 7th & Trinity! I believe it’s open Thursdays through Saturdays late night! !